www.cheersonline.com 28 • March 2015 GROWING ON THE VINE 2015 Growth Brands adapt to changing consumption patterns LIKE THE LARGER BEVERAGE MARKET, the wine industry was affected this year— positively and negatively—by consumers trending toward occasion-based drinking. 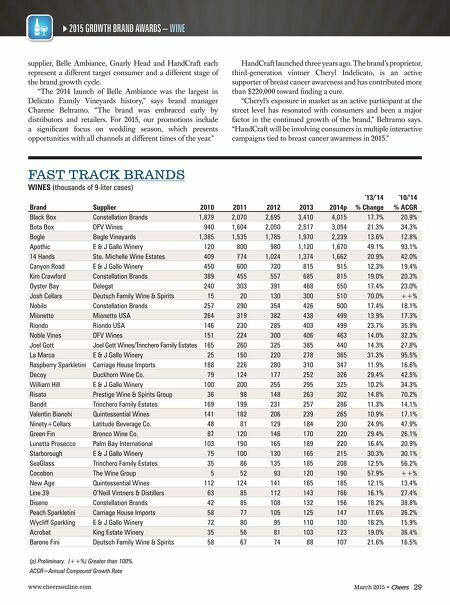 This year's Growth Brand winners include stalwart brands able to keep up with shifting wine preferences, as well as newcomers that are expanding the traditional defi nition of wine. "The wine industry is facing its most competitive market in history, causing many quality brands to post fl at or slightly declined sales," says The Beverage Information & Insights Group's Rogers. "This year's growth has come primarily from newer products in certain segments, such as red blends, prosecco and cava. These new wines are attracting a lot of attention, especially with Millennial consumers, and creating a niche for themselves within the industry." Rogers points out that quality table-wine brands, such as Leese-Fitch, were noticeably absent from this year's list. Previous Fast Track winners in many cases did not grow the necessary 10% in 2014 to remain in that category, and also haven't reached 400,000 nine-liter cases to qualify as an Established Growth brand. But the winners do include fi rst timers that capitalized on industry trends. Myx Fusion, a combination of sparkling moscato wine and fruit juices launched in 2013, is one example. "Myx Fusion's fi rst-year case sales were very impressive, which translates back to creating a niche through spokeswoman Nicki Minaj," Rogers says. SPANNING THE PORTFOLIO A number of wines, both mature brands and newcomers, from the Delicato Family Vineyards family earned Growth Brand Awards this year. 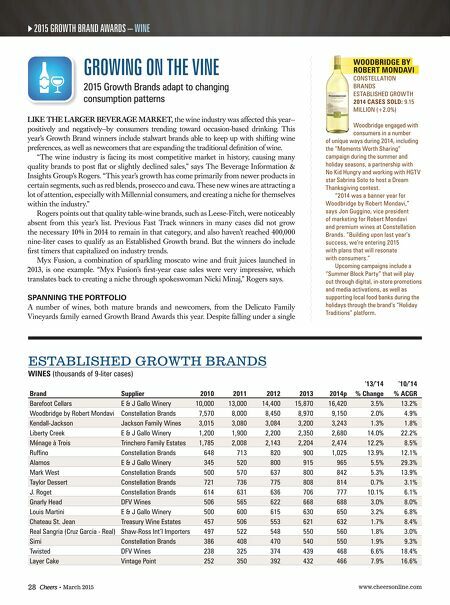 Despite falling under a single 2015 GROWTH BRAND AWARDS – WINE ESTABLISHED GROWTH BRANDS WINES (thousands of 9-liter cases) '13/'14 '10/'14 Brand Supplier 2010 2011 2012 2013 2014p % Change % ACGR Barefoot Cellars E & J Gallo Winery 10,000 13,000 14,400 15,870 16,420 3.5% 13.2% Woodbridge by Robert Mondavi Constellation Brands 7,570 8,000 8,450 8,970 9,150 2.0% 4.9% Kendall-Jackson Jackson Family Wines 3,015 3,080 3,084 3,200 3,243 1.3% 1.8% Liberty Creek E & J Gallo Winery 1,200 1,900 2,200 2,350 2,680 14.0% 22.2% Ménage à Trois Trinchero Family Estates 1,785 2,008 2,143 2,204 2,474 12.2% 8.5% Ruffi no Constellation Brands 648 713 820 900 1,025 13.9% 12.1% Alamos E & J Gallo Winery 345 520 800 915 965 5.5% 29.3% Mark West Constellation Brands 500 570 637 800 842 5.3% 13.9% Taylor Dessert Constellation Brands 721 736 775 808 814 0.7% 3.1% J. Roget Constellation Brands 614 631 636 706 777 10.1% 6.1% Gnarly Head DFV Wines 506 565 622 668 688 3.0% 8.0% Louis Martini E & J Gallo Winery 500 600 615 630 650 3.2% 6.8% Chateau St. Jean Treasury Wine Estates 457 506 553 621 632 1.7% 8.4% Real Sangria (Cruz Garcia - Real) Shaw-Ross Int'l Importers 497 522 548 550 560 1.8% 3.0% Simi Constellation Brands 386 408 470 540 550 1.9% 9.3% Twisted DFV Wines 238 325 374 439 468 6.6% 18.4% Layer Cake Vintage Point 252 350 392 432 466 7.9% 16.6% WOODBRIDGE BY ROBERT MONDAVI CONSTELLATION BRANDS ESTABLISHED GROWTH 2014 CASES SOLD: 9.15 MILLION (+2.0%) Woodbridge engaged with consumers in a number of unique ways during 2014, including the "Moments Worth Sharing" campaign during the summer and holiday seasons, a partnership with No Kid Hungry and working with HGTV star Sabrina Soto to host a Dream Thanksgiving contest. "2014 was a banner year for Woodbridge by Robert Mondavi," says Jon Guggino, vice president of marketing for Robert Mondavi and premium wines at Constellation Brands. "Building upon last year's success, we're entering 2015 with plans that will resonate with consumers." Upcoming campaigns include a "Summer Block Party" that will play out through digital, in-store promotions and media activations, as well as supporting local food banks during the holidays through the brand's "Holiday Traditions" platform.